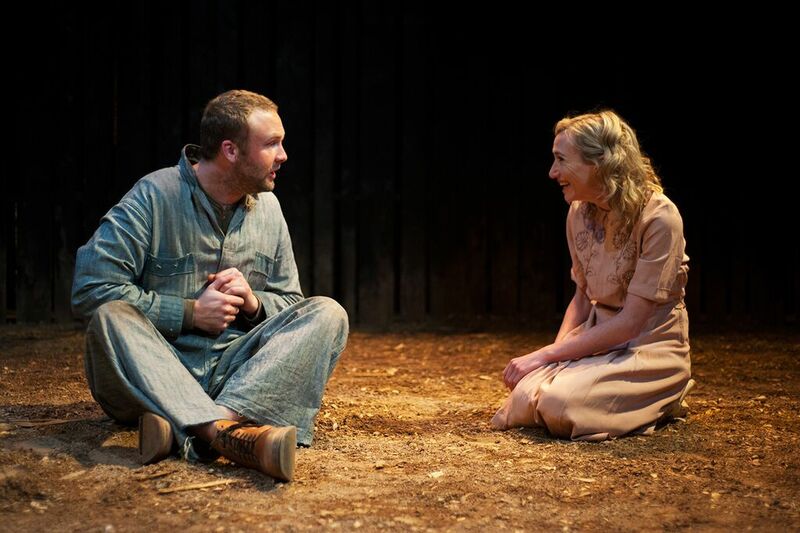 It is a testament to the great writer, John Steinbeck that Of Mice and Men can be told so often, can still move so powerfully and can retain its precarious balance refusing to fall helplessly into melodrama while fearlessly courting the emotions. The tragic story of unfulfilled dreams, those best laid plans, enmeshed with Steinbeck’s plea to understand each other better has been read and reproduced so many times, yet it never fails to move and to bring everyone closer to the inevitable devastation of what it is to be human. There exists a vague whiff of the corny about Of Mice and Men, and although one of its amazing strengths is its longevity, it must be clearly stated that in the wrong hands the book, and in this circumstance play (they are cleverly interchangeable) Steinbeck would not have a perfectly realised vision. 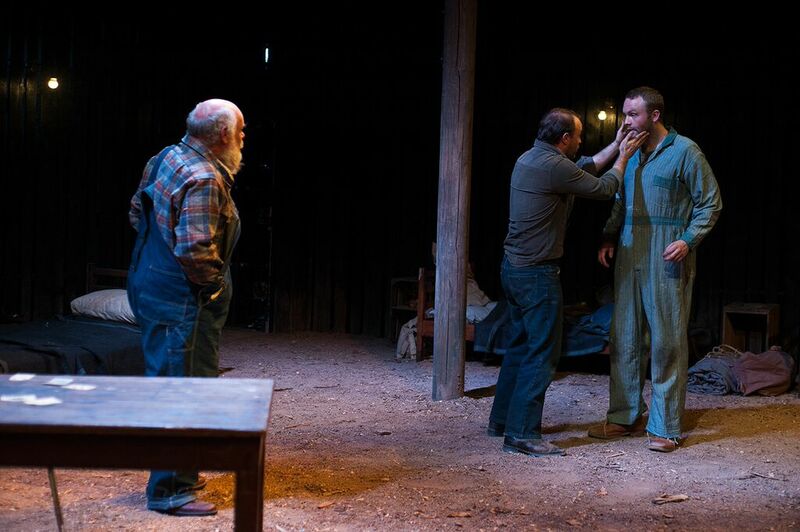 Of Mice and Men is only powerful with the right production, and in the current Sport for Jove presentation, we have exactly all that is required to bring this potent and deeply moving play to life. 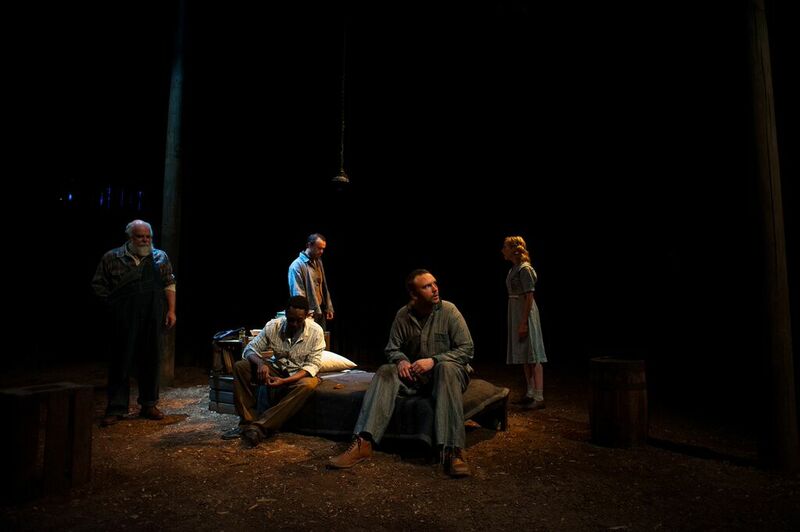 This particular production revolves around a standout performance by Andrew Henry as Lennie and the precise, intricate direction of Iain Sinclair whose haunting wood-chip world fills the Reginald Theatre with the sounds, smells and sights of Depression-addled California, yet manages to remain close to the universal humanity that makes Of Mice and Men such an accessible narrative. 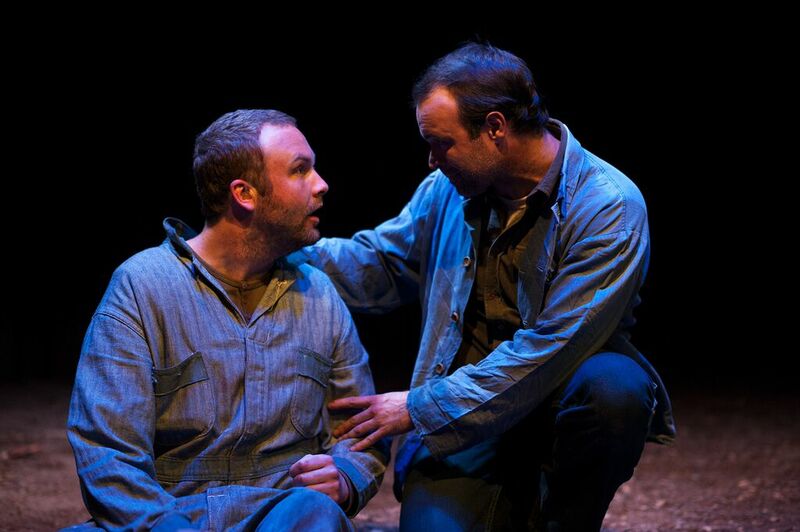 The men are always positioned separate when together as Sinclair constantly emphasises Steinbeck’s lament for the lonely individual, and he keeps Lennie and George (also beautifully performed by Anthony Gooley) apart so that their bond becomes a palpable thing, even to the audience. Sinclair is a masterful director whose command of the relationship between physical and emotional space is on full display here so that distance becomes political and proximity a necessary evil. Even when the men perform work tasks in unison there is a sense of lonely washed distance between them. Poverty divides, is Steinbeck’s message, rather than unites and this is beautifully realised in Iain Sinclair’s gripping direction. And no one is more poverty struck than the equally strong and weak Lennie. 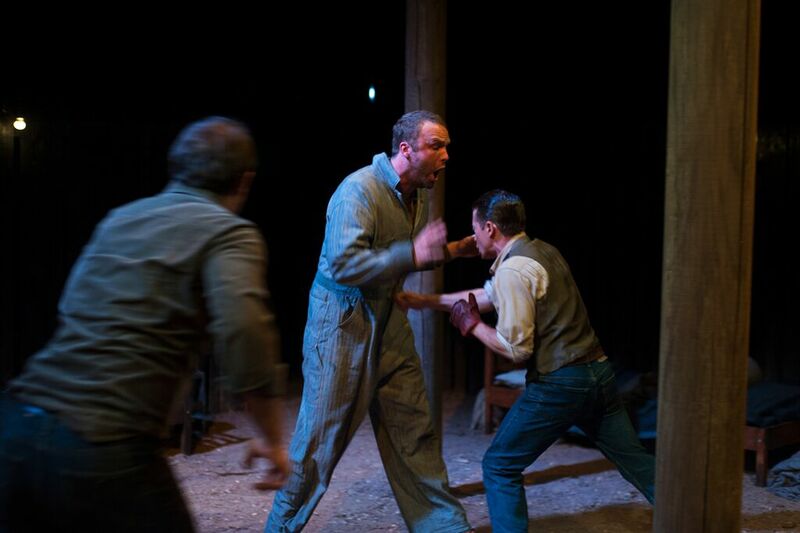 Andrew Henry has been performing angry young men a lot over the last twelve months, but he finds his stride in the Steinbeck anti-hero, the super strong success story crippled by his childish mind. One of my personal bug bears is an overplaying of Lennie; there have been too many that lacked the understated subtlety that Andrew Henry instinctively understands. Andrew Henry has a strong voice that he uses to great effect here, keeping the affectations to a minimum, rather using movement and gesture to bring us close to the man-child Lennie is. His performance is wide-eyed and innocent alternating between fear and euphoria. It was difficult to imagine how we could hear about the rabbits and have it be fresh and beautiful, yet Henry achieves this with an unexpected delicacy. Lennie’s great counterpoint and friend is the mature for his age George, here played by Anthony Gooley who manages to convey the genuine warmth and friendship he has for Lennie that extends far past the reach of his vocabulary. Of Mice and Men is a story of companionship, of the necessity of human interaction and Anthony Gooley’s George knows if it weren’t for Lennie he would have spent all his money in the whore houses drinking to forget. 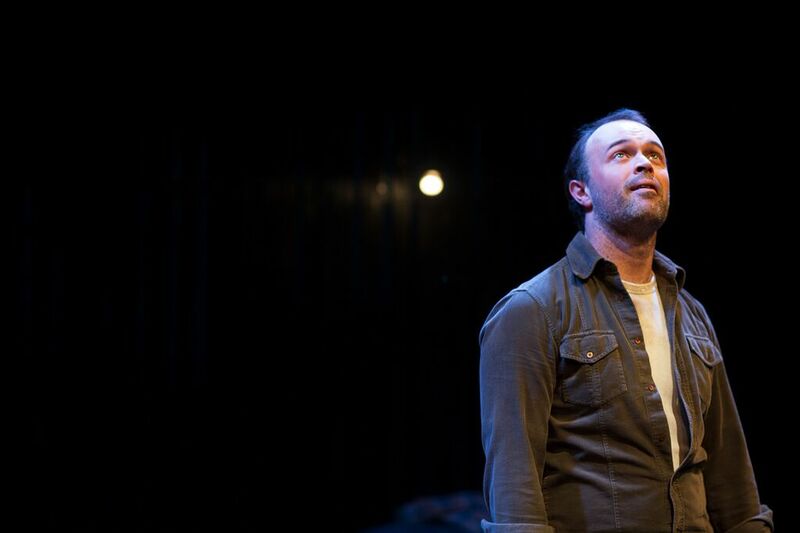 In the tumultuous final scene that never fails to move the audience to tears, Gooley’s George keeps the potency of the moment close to his chest using action rather than words to convey his respect and love for his friend. Gooley’s matter-of-fact approach at the crucial end encapsulates all the themes of the play and reminds us that one of the hardest loves to master is that of friendship. He and Andrew Henry are backed up by a superb cast that flourish under Sinclair’s direction to produce a show of the highest standard, particularly Anna Houston who brings a world of feminine perspective and sympathy to her controversial role. Extra props go to Laurence Coy, John McNeil and Old Dog for having the dexterity and presence of mind to successfully navigate including a live dog in the cast! All of this is performed on Michael Hankin’s sumptuous set that smell of shaved eucalypt trees, musty sawdust and hay. Like the performances the set is understated and mature while equally evocative and rich. Sian James-Holland’s lighting is a particular standout calling forth tumescent emotions over the top of the specific locale. Nate Endmonson’s sound includes the expressive solitary guitar that then includes a realist perspective with environmental sound that becomes an intimate part of the emotional impact. All in all Iain Sinclair has produced a wonderful night at the theatre that complies with the always high standard Sport For Jove insists on with its productions. And a shout out to the very few of you who are not familiar with the story – rush to see this before anyone tells you what it’s about. It is a magnificent introduction to Steinbeck.